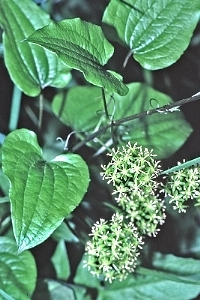 Smilax pulverulenta.© Gary P. Fleming.2014.Virginia Botanical Associates. www.vaplantatlas.org (Accessed 5/2014). Smilax pulverulenta is a perennial monocotyledon, herbaceous vine, unarmed, climbing by tendrils. Leaves alternate, green, shiny below, leaf stalks 3-9 cm, blade broadly egg-shaped to rounded, tip pointed, base lobed to rounded, margins convex, entire; major veins parallel, palmate. . Flowers yellow-green, radially symmetrical, petals 6, 0.4-0.6 cm long; inflorescence of umbrella-shaped clusters of 10-35 flowers, males and females on separate plants (dioecious) April-May. Fruit fleshy, black without a waxy bloom. 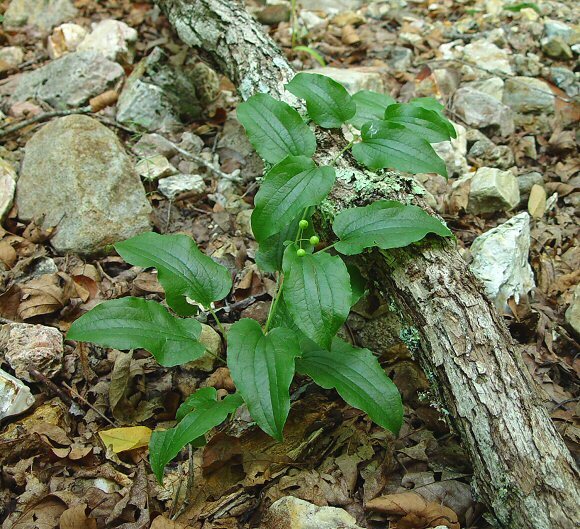 Smilax pulverulenta plant.green fruit.Dan Tenaglia.Missouriplants.com (Accessed 3/2017). Frequency in NYC: Infrequent. Listed as rare, (G4G5; NYS S1, E). Notes: S. pulverulenta is sometimes classified as a variety of S. herbacea (Gleason and Cronquist 1991).